There was a very interesting report recently from rent.com.au - a list of the most common dog breeds included on applications for pet-friendly rental properties. To save you clicking, here’s a screenshot of the list. Firstly, it seems we love mutts. Secondly, we love Staffies. A lot. Staffies are more than twice as popular as any other pure bred. So why is it that across Australia, the majority of dogs on death-row at the pound are Staffies? Why are there so many Staffy rescue organisations? We love them, we buy them, so why are we not keeping them? And why do we read and hear about Staffies viciously attacking adults and even children? There’s a very simple reason — backyard breeding. A Staffy from a reputable, registered breeder who breeds for temperament as well as looks, is still going to be a handful, plain old. Staffies are strong, stubborn, independent, high energy dogs who just want to be near you and love you all the time. Literally, all the time. Preferably sitting on top of you on the couch, or happily in bed with you, lying on your face so you can’t breathe. They want to be with their people. They are extremely loyal and protective–which means they don’t want other dogs (and sometimes other humans) near their family. So, back to backyard breeders. Because of the enormous popularity of Staffies, there are big bucks to be made. BYBs don’t breed for temperament or health—they do it purely and simply for the money. A BYB will breed a male with its mother, grandmother, and/or female litter mate, then pups from that litter, over and over again. And therein lies the problem. Inbreeding. Highly inbred Staffies almost always have health issues — and they inevitably have an unstable temperament. And by unstable I mean a tendency to sudden aggression. There are literally thousands of badly bred, high energy, potentially dangerous Staffies in Australia. And that is the main reason so many end up in at pounds and rescue organisations across the country. 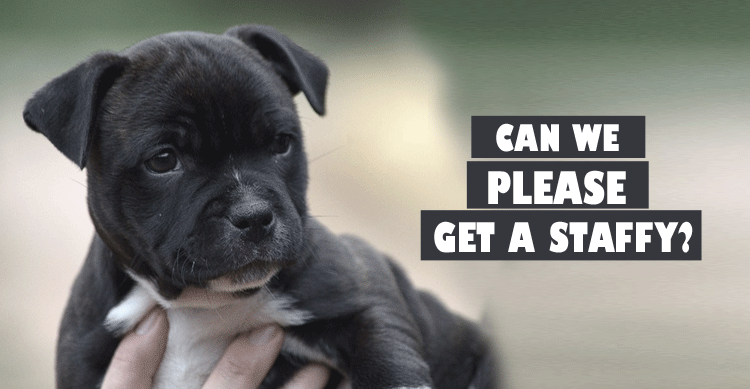 Sadly, a Staffy at the pound will almost inevitably exhibit significant behavioural problems, which will need an experienced dog person to manage for the rest of its life. If you choose a Staffy or Staffy-mix for your family, remember she will always need strong leadership and early socialisation. As well, socialisation must be consistent and ongoing; dogs drop into bad habits very quickly. Staffies require real commitment 24/7 from the whole family. They deserve it! Perfect Pets aims to help you make informed choices and connect you with reputable breeders. Please see our advice on finding a good breeder - what to look out for, and what questions to ask. One of the best tell-tale signs of what sort of breeder you're dealing with is how much they want to know about you. Caring, reputable breeders will ask a lot of questions to ensure that their pups only go to the best homes. They will also make sure that you understand the socialisation and training needs of your new pup, and provide ongoing advice and support.